We hope this finds you well as the news confirms that we are officially now in the rainy season. We are also pleased to announce our latest exhibition rotation at the Shirokane gallery. 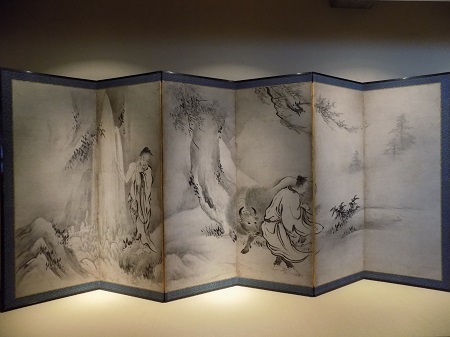 Welcoming visitors in the large alcove on the left as you enter the space is a pair of Kano school screens depicting the Chinese legends Huang Chuping and Xuyou・Chaofu. 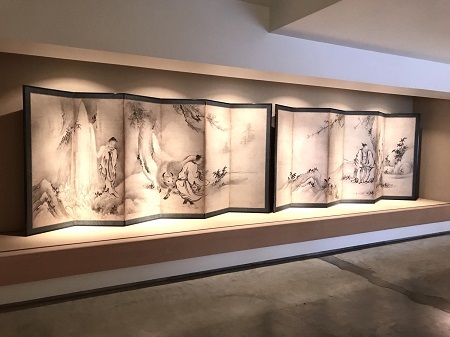 The right screen features the Taoist immortal Huang Chuping, whose story comes from the book Shenxian Zhuan, a compendium detailing the stories of Chinese deities and immortals. In his youth as a shepherd, Huang is said to have encountered a Taoist sage, and eventually learned its mystical ways and became an immortal himself. Following the gaze of the man and attendant facing Huang, you can see a rock that Huang is transforming into a sheep, a unique skill he is said to have attained after some forty years of practicing Taoism. 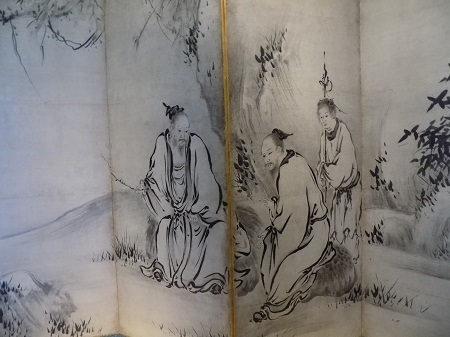 The left screen features the characters Xuyou and Chaofu, legendary scholar gentlemen who detested the vulgar world of the famous and political elite in ancient China. Upon hearing that Emperor Yao intended to relinquish the throne to him, Xuyou thought his ears were so defiled by the idea that he washed them out in a nearby river. Chaofu then considered the water polluted and refused to let his ox drink from it. Also on display are ceramic wares from the Bizen, Tokoname, and other kilns, so we hope you will take the opportunity to stop by and see the show. ※ Please note that certain exhibits may be rotated during this time.